The lesson for Naaman will end our study on Elijah and Elisha. We will finish the lapbooks and they can take them home. There is a door hanger with a box pocket. I printed the door hanger on blue cardstock, and Naaman and the front pocket on white cardstock. The kids glued a large craft stick inside of Naaman so he could be moved in the pocket. See the photo below for more! Review: We have been studying Elisha. He was a prophet after Elijah was taken to heaven in the flaming chariot. The widow had told Elisha that she didn't have any money and the creditors were going to take her sons. Elisha told the widow (a woman whose husband has died) to gather up all the pots from everyone she could. 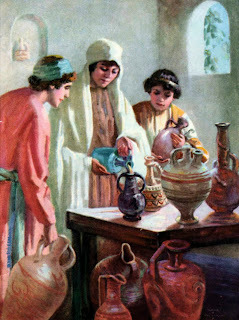 After they had the pots collected, they closed the doors and poured oil from one bottle into every jar they had borrowed! That was a miracle! Then, there was a couple that fed Elisha and had a bedroom built for Elisha when he stayed at their home. Gehazi was a servant that was traveling with Elisha. They were talking and Gehazi told Elisha that the couple did not have any children. Elisha told the woman that she would have a son the next year, which she did. The son was working in the fields one day and had a headache. He died but Elisha came and stretched himself on the boy and he was alive again! Lesson is found in 2 Kings 5: There was a commander in the army of the king of Syria. His name was Naaman and he was considered great and honorable but he had leprosy. (explain) The Syrians had gone out on raids and brought back a girl from Israel. She was a servant helping Naaman’s wife. Naaman told the king of Syria what the servant had told his wife about Elisha the prophet. The king of Syria sent a letter to the king of Israel, along with gold & silver and 10 changes of clothing. When the king of Israel received the letter, he tore his clothes in frustration and said Am I God? To kill or make someone live? Am I supposed to cure this man of his leprosy? Why does this king of Syria have a quarrel with me? Elisha heard that the king had ripped his clothes and asked the king to let Naaman come visit with him. Elisha would let Naaman know that there was a prophet of God in Israel. Elisha sent a messenger to tell Naaman to go wash in the Jordan River 7 times and he would be healed. 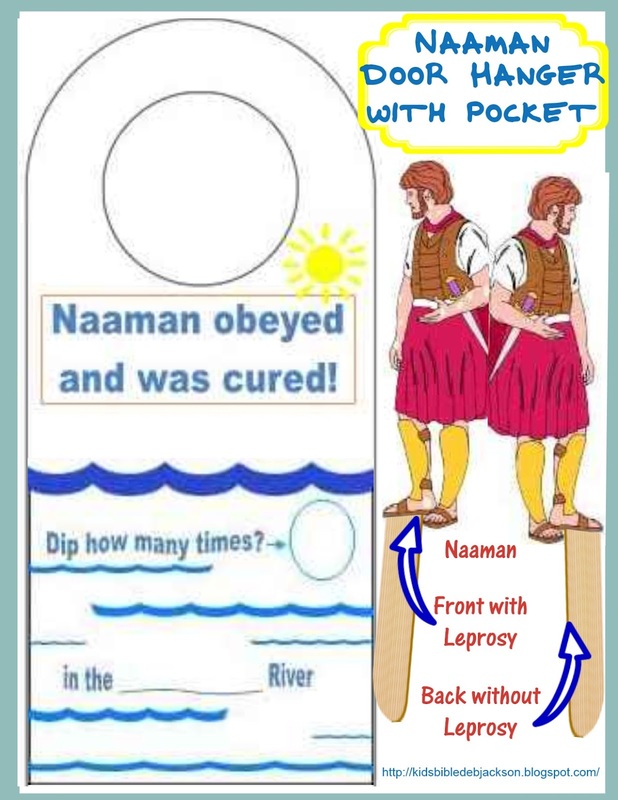 Naaman went down in the Jordan River, just like Elisha told him to. He dipped himself 7 times and he was healed! The skin from the leprosy was just like a child's! Naaman went to thank Elisha and said he would only worship the God of Israel, the true God, and not idols anymore. He begged Elisha to take gifts for healing him, but Elisha didn’t want any gifts. Ga-hey-zee) Elisha’s servant Gehazi followed after Naaman and told him that Elisha changed his mind about the reward. Naaman gladly gave him silver and clothing. Gehazi went back and hid the items from Naaman in his house and went to see Elisha. Elisha asked “Where have you been?” Gehazi told Elisha “I didn’t go anywhere.” Elisha told him that he knew Gehazi went to get money and clothing from Naaman and because he lied, Gehazi would be struck with the leprosy disease of Naaman. When Gehazi left, he was snow white full of leprosy. I made these door hangers before class so they were ready for the kids to use. They cut out Naaman, folded him and glued him together with a large craft stick on the bottom inside. Then, they could put him up through the bottom of the pocket and make the leprous side of him go up and down 7 times, then turn him around to be clean. Click here to print it. 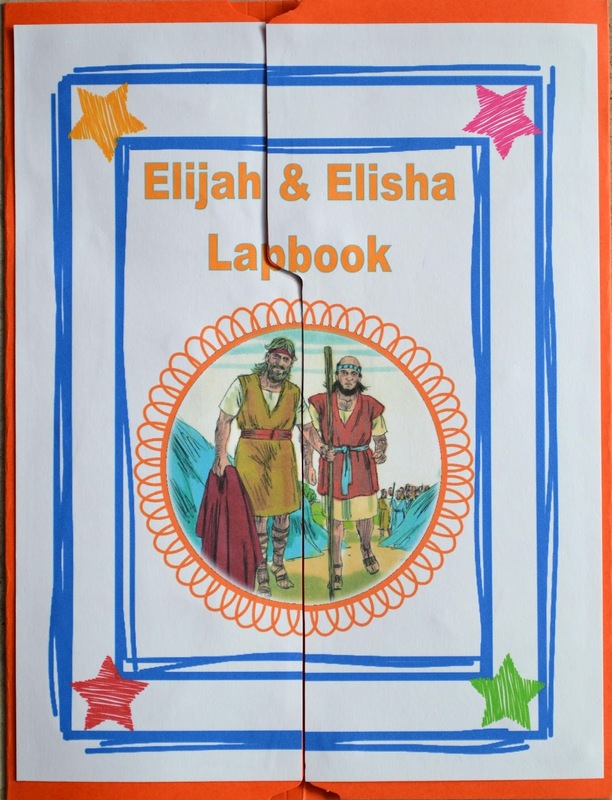 This lapbook is being used with each of the Elijah and Elisha lessons. love Biblical lapbooks, this one looks great! Thank you! Thanks for stopping by and thank you for hosting! If a server cannot be found, that is an error with your internet service. These older posts will take you to the original site of all the visuals where I found them. The visuals are currently being added to the new preschool posts and one PDF with the updated (cropped, color corrected, etc.) pictures. I have added the set here for you just above the lapbook along with the pictures to color that will be in the Naaman preschool post Oct 6, 2017. Thanks for stopping by. Such a great story with applications, too! Thanks for the hangar craft that I can use for my Sunday School this Sunday. God bless!